The trail does not demand you to start with any one object and it really allows you to dip in and out at your own leisure. So what is object No 85? Well its a large pulpit approx 6m tall which once stood in the Cathedral of the Assumption in Carlow town which is coincidentally next door to the museum. The pulpit is made of oak, it was designed by CJ Buckley of Youghal and made by craftsmen in Bruges ( Belgium) in around 1898 to coincide with renovation to the Cathedral ( built in 1830s). The panels are decorated with scenes of saints preaching, angels and the stair railing at the back has a very pretty tree and bird design. The Museum Curator Dermot Mulligan kindly brought me to see where the pulpit originally stood within the Cathedral church. He told me that despite a lot of objection from local people the pulpit was removed during renovations during the 1990’s and sometime late became part of the museum collection. The original location of pulpit is at the pillar close to the altar on the right hand-side. 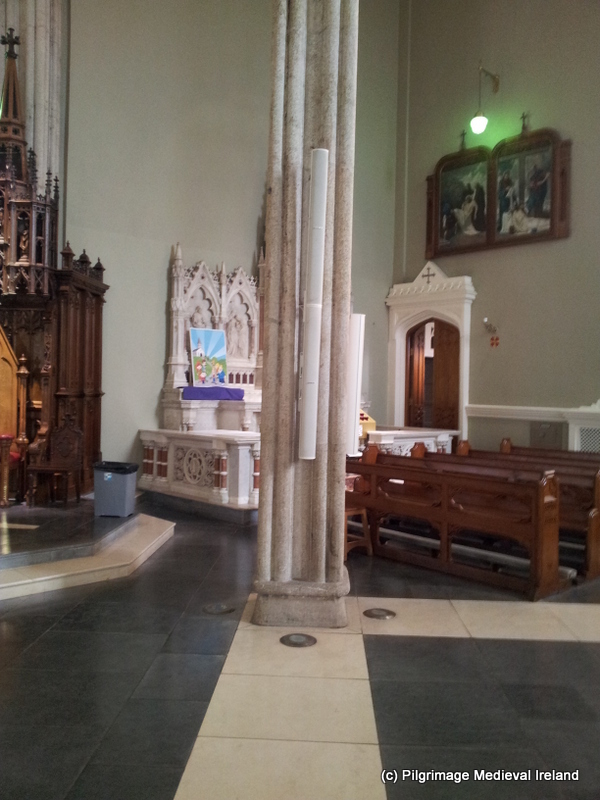 The original location of the pulpit was on the right hand side of the church beside the pillar nearest the altar. 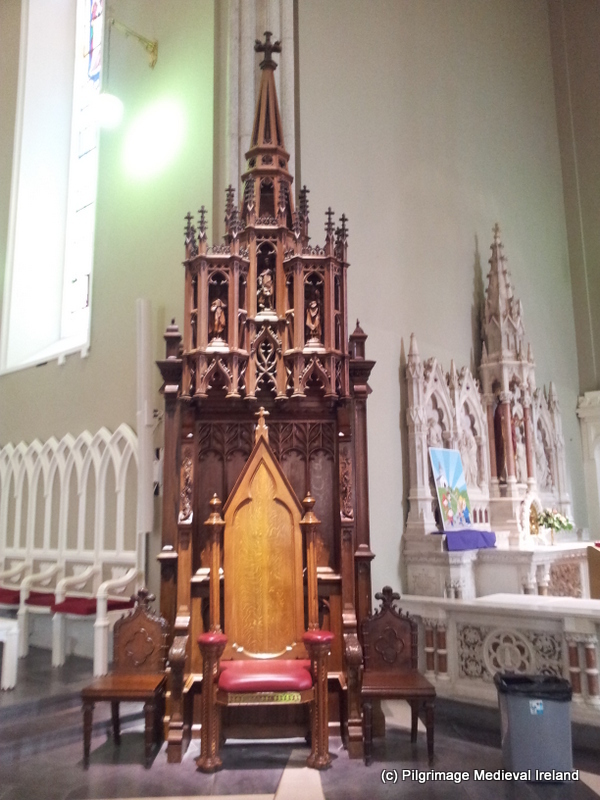 Close to the here is the location of the bishops chair which has a similar style as the pulpit. The chair was commissioned at the same time as the pulpit and also made in Bruge. 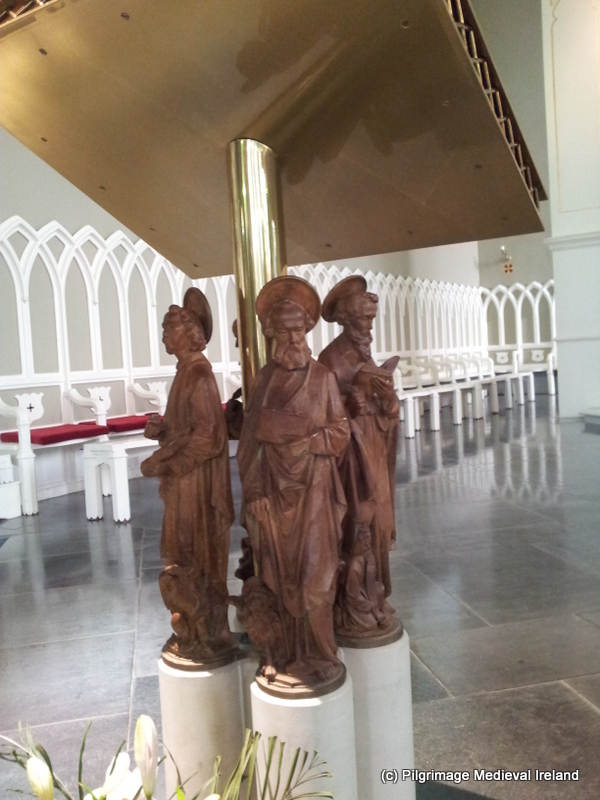 It is nice to see that despite the removal from the church there are still links to pulpit (which is in the museum) as the modern pulpit has miniature carvings based on figures from the original. No 85 of the Ireland in 100 historic objects is well worth a visit and if you take your time when viewing it, you will discover lots of stories and themes in its carvings. I would recommend along with the visit to Carlow County Museum that you also visit the Cathedral as it allows you to better imagine how the pulpit looked in its original location. I am looking forward to checking out some of the other objects in the coming months. This entry was posted in Uncategorized and tagged carlow county museum, Ireland in 100 objects, Pulpit at Carlow County Museum. Thanks for visiting and for your posting on a wonderful object. 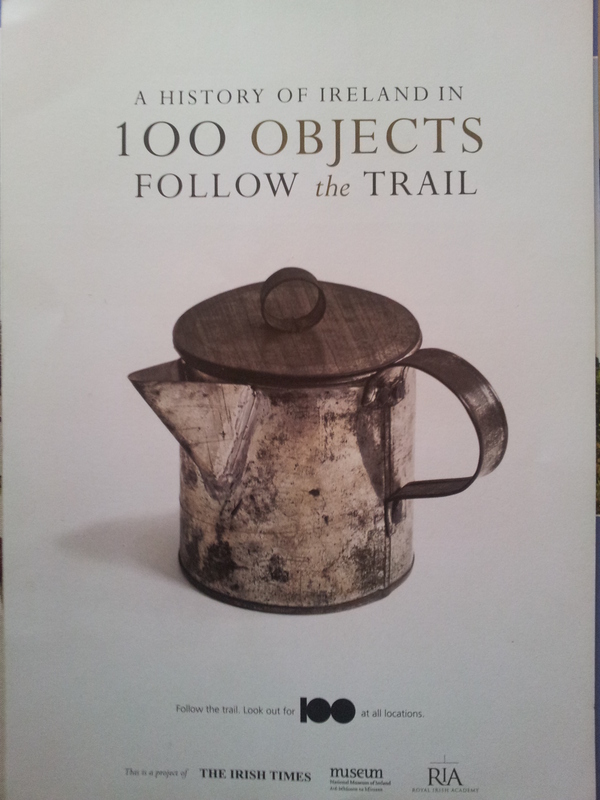 Hope Santa left you the ‘History of Ireland in 100 Objects’ under the tree! Last year the wonderful publication ‘A History of Ireland in 100 Objects’ by Fintan O’Toole won the Best Irish Published Book of the Year in the Bord Gáis Energy Irish Book Awards. The book is based on the weekly series that was published in the Irish Times newspaper which featured a different object each week. The project was undertaken in association with the National Museum of Ireland and the Royal Irish Academy. All of the objects are part of public collections both here in Ireland and abroad. 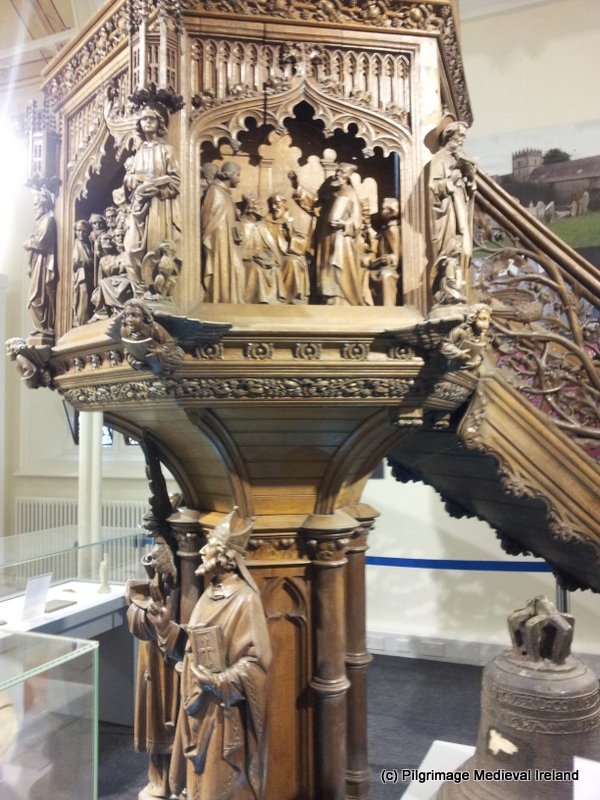 We are delighted in Carlow County Museum that the magnificent 19th century hand carved pulpit from Carlow Cathedral has been included in the list. The pulpit was removed from the Cathedral in the mid 1990s as part of its major renovations. 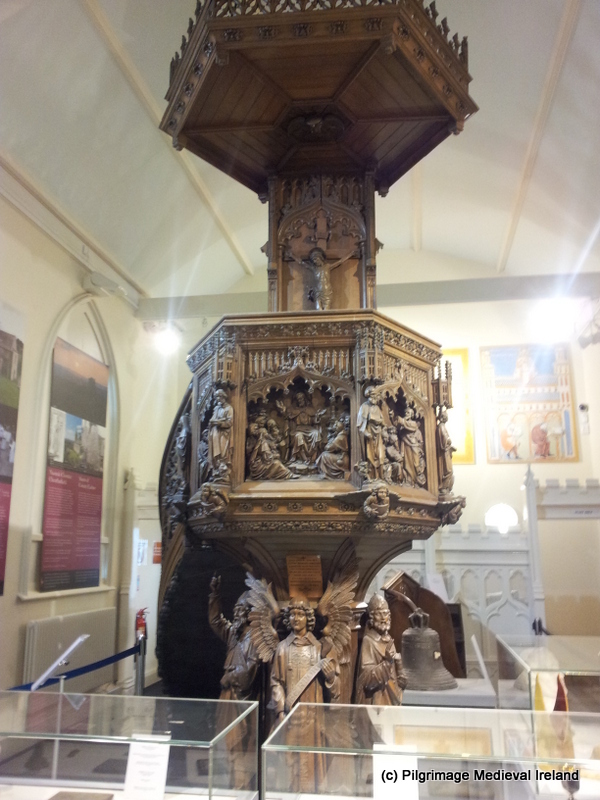 The pulpit is now on display on the first floor of Carlow County Museum, it is by far our largest object standing at approximately twenty feet. Pop in and have a look for yourself.